As you may know, this past Saturday my good pal Gizmo and I had our first in-person meeting and it was PAWESOME. We met at Lake Ida Park in Delray Beach, Florida for a morning filled with walking, running, geocaching and general terrier craziness. Gizmo and I got along famously and you will be able to read all about our park adventures later this week in Gizmo's Travel Thursday post. Don't miss it! After the park, Ma and I had secret-special plans for Gizmo and Miss Beth. We decided to take them to a very dog-friendly restaurant in Boynton Beach - Hurricane Alley Raw Bar and Restaurant - to dine al fresco. 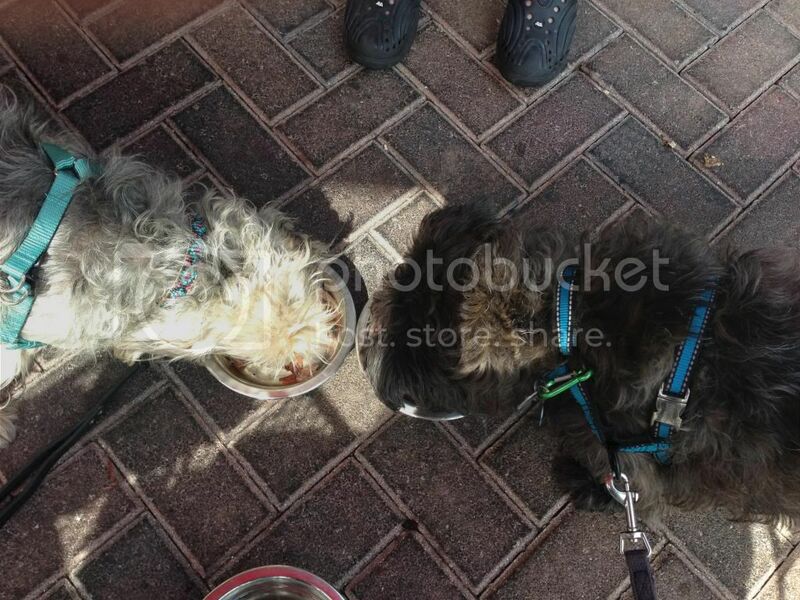 We sat outside on the covered patio and the very nice hostess brought Giz and I our own bowls of fresh water. While Ma and Miss Beth enjoyed their beverages, Giz and I sipped our water and gave the menu a once-over sniff....and guess what we found?!? 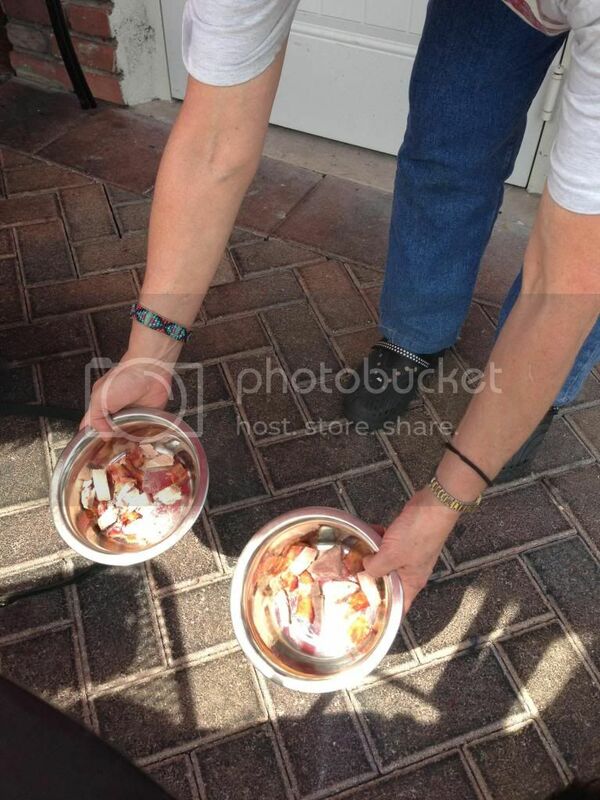 A menu section titled "Hurricane Alley's Doggie Bites". Now, you know this is a true dog-friendly restaurant when there are snacks for dogs listed right on the menu. Wow! 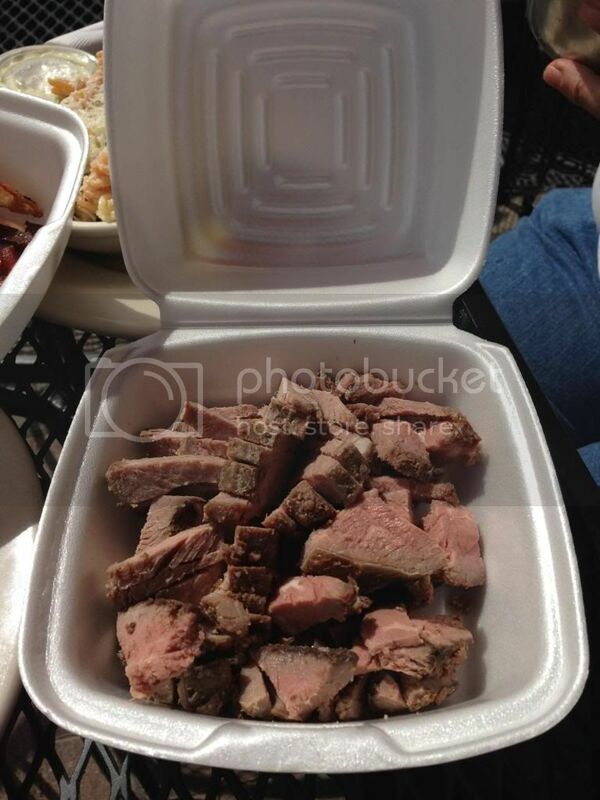 Look at all that Roast Beef! Our wonderful waiter brought us two bowls and Ma and Miss Beth set to work dividing up our snacks. Giz and I were drooling with anticipation. We ate our first helping in a matter of minutes and then impatiently waited until seconds were served. There was still plenty left over so Ma and Miss Beth split up the remaining bacon and roast beef for our doggie bags of doggie snacks. Ma and Miss Beth said that the human food was just as good as our Doggie Bites, which is great to hear. That makes Hurricane Alley Raw Bar and Restaurant one of the best dog-friendly places we have been to yet. Gizmo and I give Hurricane Alley Raw Bar and Restaurant a rating of 4 (out of 4) Dog Bones. Giz and I had such a GREAT time on Saturday so don't forget to visit Gizmo's blog on Thursday to read more about our adventures! 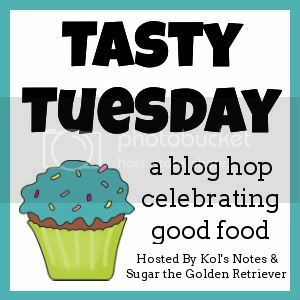 I am joining in the Tasty Tuesday Blog Hop over at Kol's Notes...since Giz and I had a very Tasty Saturday! wow that is amazing! a menu just for dogs, with reasonable prices and huge servings!! What a great find! Looks like you and Gizmo had fun. Thank you for stopping by and saying happy birthday to Kelly. I know! The restaurant is truly dog-friendly! We got our water before Ma and Miss Beth got their drinks. BOL You are welcome...I was happy to stop by for Kelly's birthday. Thanks for visiting me too! That's sooo cool!! What a great place and how fun you got to met Gizmo. It was pawesome to meet Gizmo. We had a blast! The restaurant was great too! Very dog-friendly. Oz you sure are right...We did have a totally pawsome day start to finish...Our morning adventures left us with dawg size appetites and Hurricane Alley was the pawfect place fur us to go...The noms were excellent and the service fur us dawgs could not have been nicer...I'm so excited to tell efurryone about all the fun we had at Lake Ida and I can't wait till next month when we can do it again! Start to finish indeed. I cannot wait to read your Travel Thursday post so I can relive our park adventures. Then, after reading it I will come back here again to read about our delicious snacks. BOL I cannot wait until next month. We are going to have a greata time again! What a cool restaurant! I am so glad you and Gizmo had such a great day together; I hope you will get to hang out together again soon!! Everything is better with bacon, don't you think? This was the BEST post EVER!! What FUN you both had! Wow they gave you enough meat for the entire blog-0-sphere! What fun!!! You sure are lucky doggies! How cool to meet in pawson!!!! I know. We could've had a doggie party with all the foodies they gave us! It was great to meet in person, Miss Caren! How fun! We would so love to meet some of our online friends and what a great restaurant...just like when we lived in Germany and could go out to eat with mom always! We have a place in FL but it is in Fort Myers which is a distance from that restaurant...I checked right away! I don't get down there much anyway. That's too bad. I bet Fort Myers has some dog-friendly restaurants too. Most of Florida allows dogs in outside dining areas. It is fun to go places with Ma, especially a restaurant. And it was great meeting Gizmo! a wwwwow! Gizzy and OZ that looks like soo much fun! we have no dog friendly restaurants where I live, oh how I wish we did though!!! Oh, I wish you did too Kirby and Miss Leah! It was such fun dining out with friends. It was a tasty meet-up, Sugar! We had such a good time. Oh my dog! I am drooling! We have an ice cream place here with doggie sundaes on the menu, but a place with actual food would be heaven! I am in total envy! Oh Bunny...you get to have doggie sundaes?!? How delicious. Wow, they actually have dog treats on the menu?! Now THAT'S a grreat restaurant! I'm telling Momma we need to go visit Florida now. They do! Isn't that amazing? You should come to Florida...we have a lot of dog-friendly restaurants (but not many have a separate menu for dogs). Oh, that's wonderful that there are dog-friendly restaurants by your house. It is such fun to dine al fresco with the humans! Hi There Oz....so nice to meet you. Wow that was some meal you had there. I'll have to look and see if there's a restaurant like that over on our side of Florida. Actually, I live right in the center of the State. You live in the center? So does Gizmo! I am sure you will find a dog-friendly restaurant or two. Florida is good like that. Wow! What a great place! You should come to Kentucky sometime and help me find dog-friendly restaurants. Will do, Mister! I bet we can find a dog-friendly restaurant near you. Oh my gosh a million years ago, my parents had a place in Boynton Beach. I would say the mid-70's to around '90. I spent many a break in Boynton Beach and a lot of time at the Banana Boat...lol. Haven't thought about that place in years. Hurricane Alley sounds wonderful. It is great that it was so dog friendly. Can't wait to hear more about your weekend! BOL It's a small world, isn't it? Ma has been to Banana Boat too. Giz will be "spilling the beans" on the rest of our adventures tomorrow. That is awesome! I'm inspired to now look for restaurants here in Northern California that are just as wonderful as Hurricane Alley! I bet you will find some. California has got to be dog-friendly too! And WE were all excited about having our kibble stirred in about a tablespoon of bacon grease.....yeeesh!! We're only allowed in Petbarn and they don't have any food samples! What a fantastic place. And thanks for stopping by our blog. We love to meet new dogs. BOL...well, I was excited that you got your kibble stirred into the bacon greasse. Thanks for stopping by my blog too. It's great to make new friends! OZ! That is the BEST THING EVER! Why doesn't anyone do that here?! We have all sorts of stupid rules about making food for humans and food for dogs in the same space. Looks like you all had a wonderful time. We're a bit jealous. Good morning, Ruby! 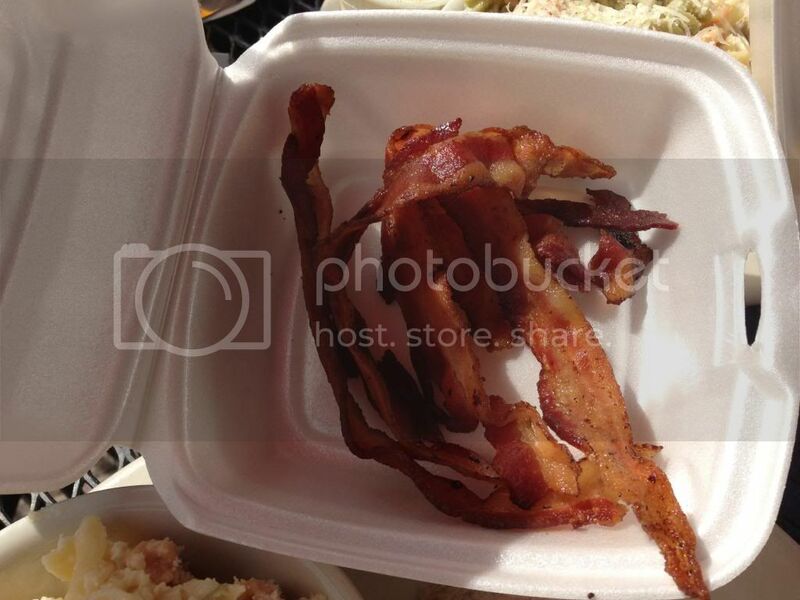 Did you dream of eating bacon al fresco at a restaurant? Those were very special treats. It's not like I eat like that every day (though I wish I did). You two look great together! I think it is so cool that you got to meet each other in person. And that restaurant sounds awesome! Your dinner looks delicious. Hi Miss Ann. Thanks for saying such nice things about Giz and I. We were best buds by the end of the day (short of one squabble over the last bit of bacon). It was so fun. I love the idea of a menu for dogs! Hi gang! Don't be jealous...just find a dog-friendly restaurant near you so you can have fun too. Wow guys, not only did you have a fab time, but a trip to a dog-friendly restaurant as well? That's pawesome! Loving the look of the doggie menu too.Think I need to move to Florida...! Wowee, you two sound like you had a fabulous time together!! I can't wait to hear more on Thursday! How neat...meeting up with someone from Blogville! I'd love to do that too (especially an awesome terrier)! Um, that food looked absolutely delicious! I love doggie menus, but it's rare that you find them! :-/ Happy Wednesday Oz! You're right, it is very rare to find a doggie menu! That's why I love Hurricane Alley - talk about dog-friendly! It was really cool meeting up with a blogville pal. I hope you get to do it some day...it is so fun! Hi Oz counldn't find your blog site yesterday, thast why we did the google + thingy, Now we are on board to follow your blog.